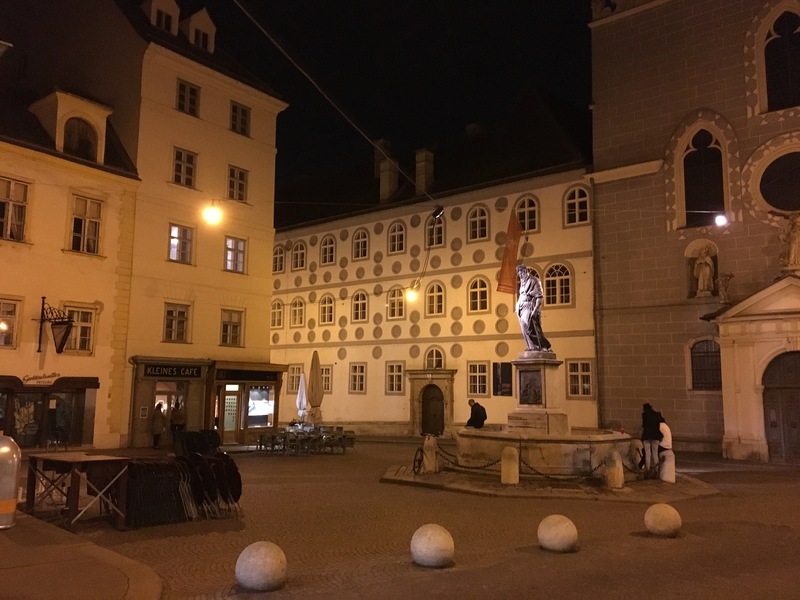 Home » Reviews » Review: Vienna cafes: which are best? Review: Vienna cafes: which are best? This is a true story from Vienna, 1986 – I was there. If my host that day (then working in the Town Hall with Mayor Zilk) is reading this, do get in touch. Can you guess in which of the cafes reviewed below the scene occurred? Clue: it was not the Hawelka. How good are Viennese cafes? Is it even fair for me to assess them, as a foreigner who has lived only four years in the city, all but the last year back in the 1980s? Most Viennese cafes are excellent. 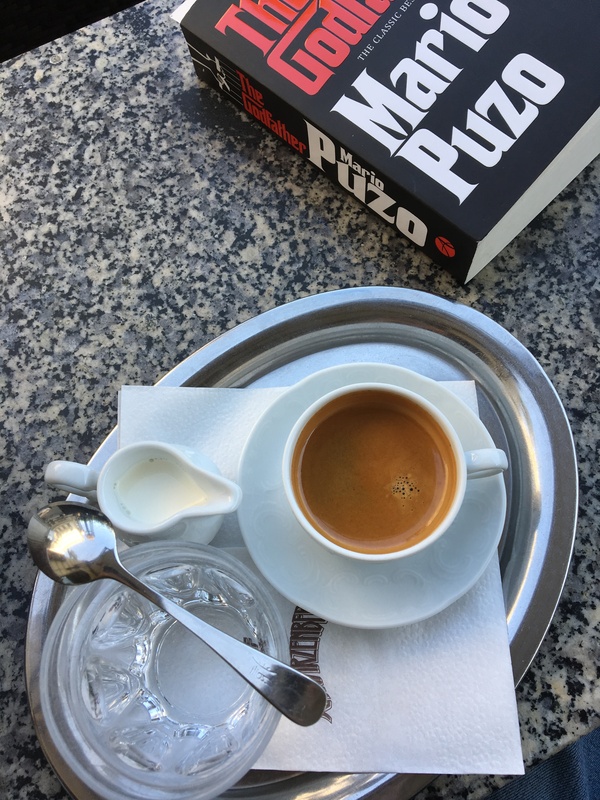 I like the fact that most of them (not all, sadly) use old-fashioned Viennese coffee-types (kleine Schwarzer, kleine Brauner, Verlängerter, Franziskaner) instead of, or sometimes in addition to, the world-conquering Italian descriptors (Cappuccino, Macchiato & Co). Many Vienna cafes have a wonderful, unrenovated charm, often accompanied by service which varies from the friendly and efficient (more common in cafes outside the first district) to a kind of studied clockwork stop-motion effect where waiters emphasise by their every action both their superiority to the customers and the fact that they will not deviate from their intended, inexorable plan of action under any circumstance. But then, what do you want? Would you rather, in Vienna, have a traditional-looking Austrian waiter, who maybe doesn’t speak English and isn’t conspicuously polite, or a fast-moving identikit youth who could be in Seattle or Siena and maybe doesn’t speak German? It’s a tricky question. Traditional waiters can be brilliant, if they know what they are doing. But if they are less than brilliant, the combination can be suboptimal. I even mention the slow service of Viennese waiters in my novel Biotime. Viennese cafes also often serve terrific cakes; and other food and drink, from sausages to breakfast and beer. Check the menu; and choose your cakes at the counter if you’re not sure. I’m keen to hear your views. I often review cafes suggested in the “Comments” boxes below – latest addition is the Cafe Museum. Cafe Bräunerhof (Stallburggasse 2, 1st District). One of my favourites. Nestling in a back street near the tourist heart of Vienna, the Cafe Bräunerhof has nonetheless kept a wonderfully shabby and unrenovated traditional ambience, complete with uniformed waiters (don’t try and sit down until they’ve shown you to a table) and, when I visited once, a musical trio at no extra charge. Has a particularly enjoyable good “stepping back in time” feeling, with plenty of locals reading books and newspapers. Apparently the Bräunerhof has a reputation for grumpy waiters but on numerous visits mine have been unusually fast and perfectly civil. Cafe Central (Herrengasse 14, 1st District). 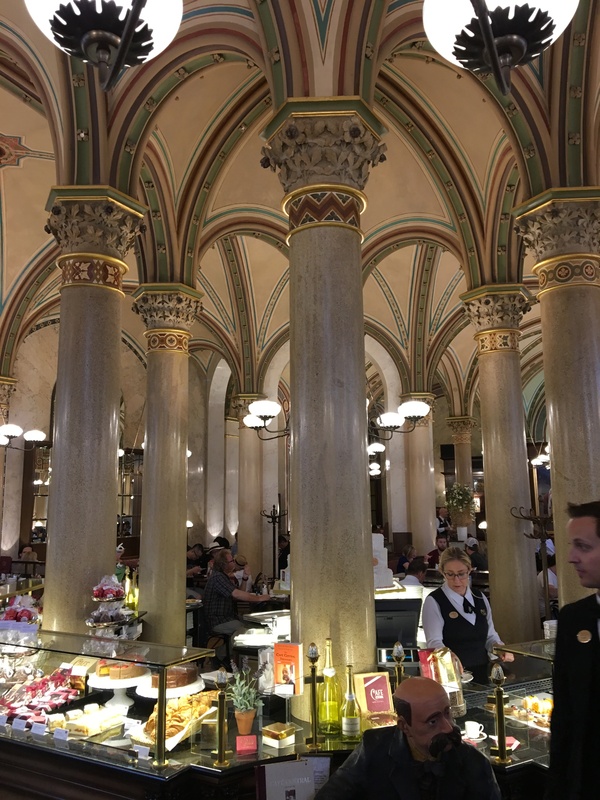 Possibly the most famous of Vienna’s traditional cafes, the Central occupies an exquisite space in the Palais Ferstel, originally built in 1860 to house the Austrian National Bank and stock exchange. Although opened “only” in 1876, the cafe’s historical legacy is powerful: Wikipedia says that when Victor Adler objected to Count Berchtold, foreign minister of Austria-Hungary, that war would provoke revolution in Russia, he replied: “And who will lead this revolution? Perhaps Mr. Bronstein (Leon Trotsky) sitting over there at the Cafe Central?” Despite repeated renovations, the Central has masses of atmosphere and is worth a visit, so long as the queues are not too long. Service can be a bit slow. Cafe Hawelka (Dorotheergasse, 1st District). A city-centre cafe with a pleasing sense of history, including busts of former owners Josefine and Leopold Hawelka and apparently unrenovated since I lived in Vienna in the 1980s. Top ambience with a pleasing sense of calm and refuge as soon as you walk in, although proximity to the Graben means it can get a bit full. Quite unique in Vienna and another of my favourites. Kleines Cafe (Franziskanerplatz 3, 1st District). Rarely was a cafe so aptly named as the Kleines Cafe (“Small Cafe”): it is microscopic. Located in one of the most ancient parts of Vienna, its unrestored facade conceals a pint-sized, unrestored interior. 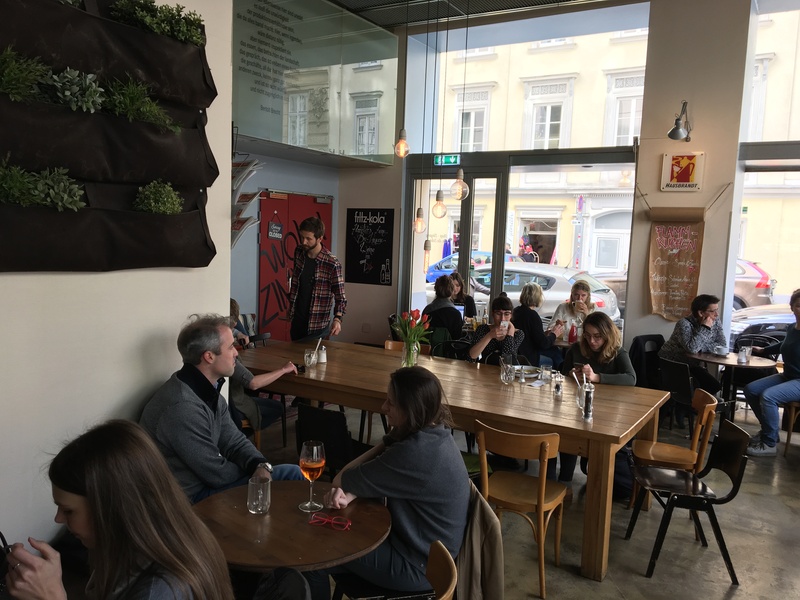 Despite its location close to peak tourist zones of the city the Kleines Cafe exhibits the so-laidback-as-to-be-nearly-horizontal style of the best old Viennese cafes, with locals taking their time to sit and read a newspaper over a leisurely cup of coffee, a beer or a sausage. A delightful, quirky place and cosy, though it can be smoky if more than a few people light up. Take care in the summer: the seats in the square outside may not belong to the Kleines Cafe. Cafe Korb (Brandstätte 9, 1st District). You can tell the Korb is something special the moment you click on their website: a steaming cup of coffee invites you, Alice-like, to “Enter”. Stepping into the cafe itself is initially less intriguing: although the furniture is allegedly ancient (the cafe was founded in 1904; Sigmund Freud was a regular), the decor is the victim of a 1960s makeover and not yet quite kitsch enough to be chic. But the ubiquitous pictures of the owner, the legendary Susanne Widl, are a hint that the Korb is something special. A decorated cellar lounge offers a rich programme of cultural stimulation from music to poetry; and the manager, Franz Schubert, also plays the saxophone. 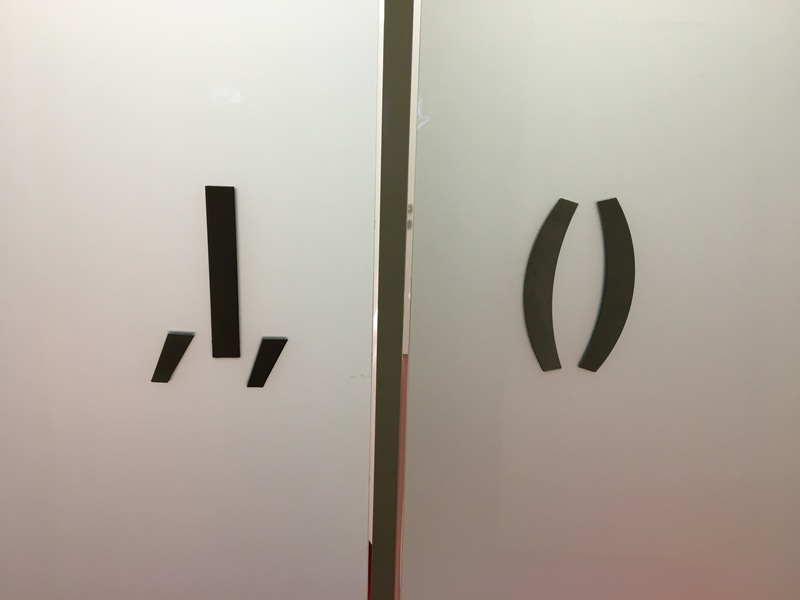 Even the loo doors are interesting (big in Japan, apparently). A find; and my hot chocolate was excellent. Check out the quirky cellar decoration, even if no event is taking place. Cafe Landtmann (Universitätsring, 1st District). 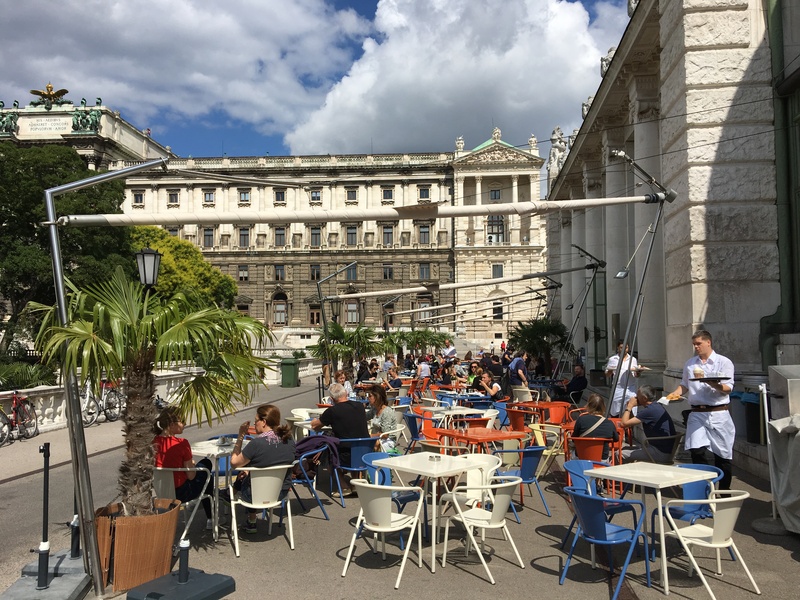 The Landtmann is one of the most famous Vienna cafes and meeting places, sitting on the Ringstrasse close to the Burgtheater, the Town Hall, the University and a host of city centre attractions. From the outside it is unexceptional; but inside, a series of spectacular linked rooms offer a host of cosy seating options – once you can get a waiter to take you to a table. The atmosphere is bustling and cosmopolitan, with plenty of both Viennese and tourists, and the uniformed waiters rushing around holding trays stacked with coffee and cakes can be a bit intimidating on a first visit. Cafe Morgenstern (Sankt-Ulrichs-Platz 5, 7th District). Hidden off the street in the beautiful but curiously underpopulated St Ulrichs Platz, the Morgenstern is determinedly grungy and alternative. Everyone is cool and hanging out, both staff and waiters. 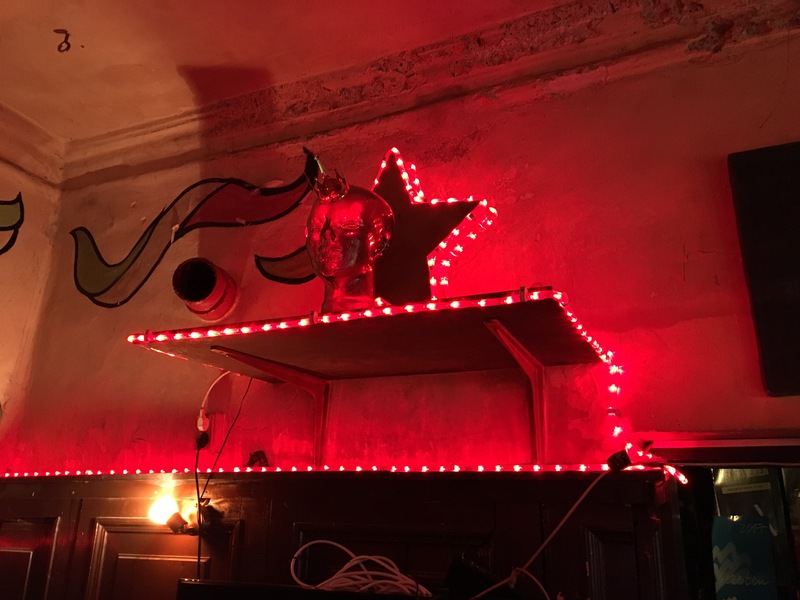 The interior is fetchingly shabby and somewhat Gothic with a sense of numerous regulars and a hint of post-communist retro-chic in the illuminated red star. Best feature for me was the terrace outside, with an immense sense of place. We enjoyed a decent Schladminger BioZwickl and a “Baguette Morgenstern”. Worth a visit if you fancy something different off the beaten track. Cafe Museum (Operngasse, 1st District). 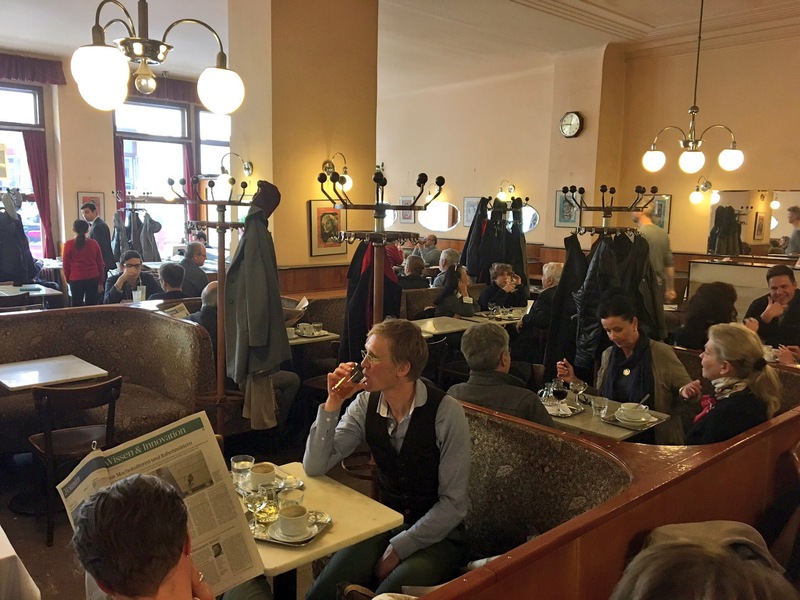 Occupying a prominent position on the corner of the Karlsplatz opposite the “Third Man” tours, the Naschmarkt and the Secession, the Cafe Museum is the epitome of an traditional coffee house which has been restored to modern standards. 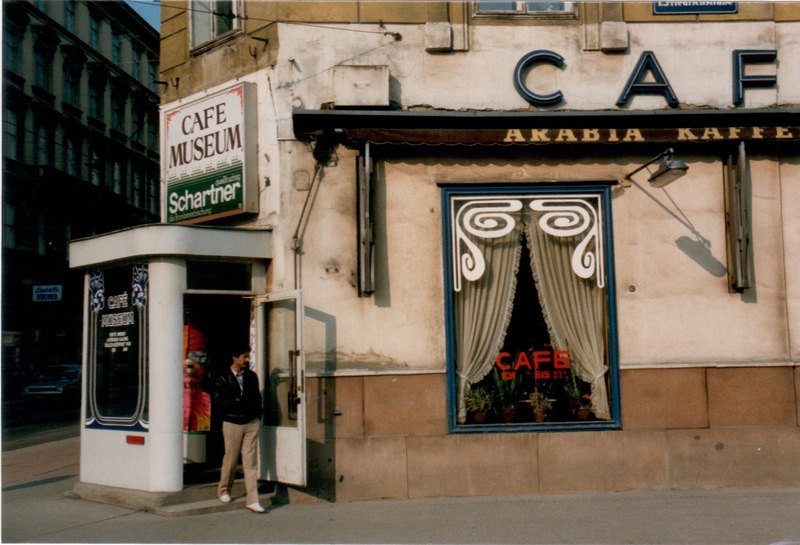 It used to be my regular in the mid-’80s when I lived nearby in the Wiedner Hauptstrasse. As the pictures below show, the restoration has improved the external appearance of the cafe, which serves a comprehensive range of food and drink in a tastefully-restored interior and boasts a large terrace outside. The Cafe Museum also runs a respected series of literary readings and, like the best cafes, doesn’t rush you. Service on my latest visit was fine. 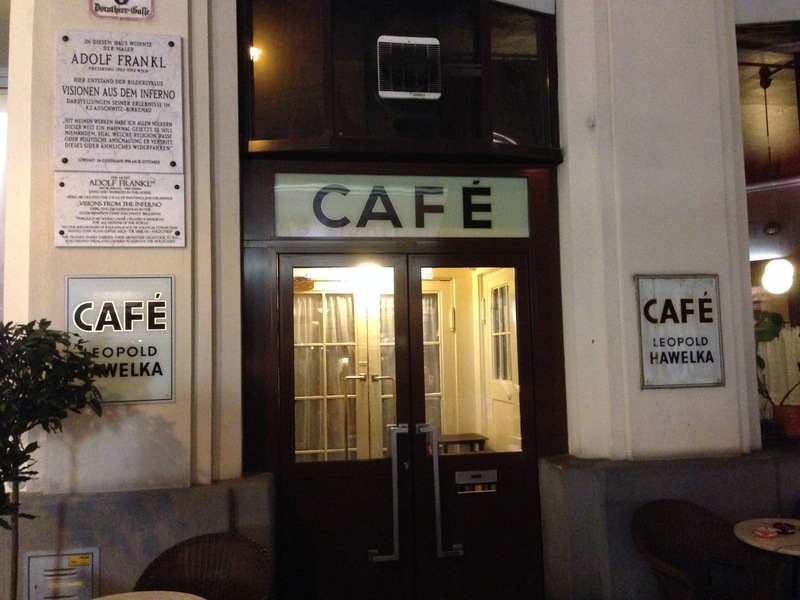 But the restored cafe perhaps lacks the charm which makes cafes like the Sperl, Hawelka or Braunerhof stand out for me. Cafe phil (Gumpendorferstrasse 10-12, 6th District). Almost opposite Cafe Sperl (below) the phil is a self-confident alternative antithesis to traditional Viennese cafes. Books, music, furniture and terrible puns are all on the menu (‘phil free to come back’; ‘bilbio-phil’; ‘audio-phil’; ‘retro-phil’; ‘phil-good’ and so on). The web-site (‘phil.info, as in viel’) is a conglomeration of cultural cool. Criticised by some as a hangout of ‘bobos’ (bourgeois bohemians’) the phil’s menu even includes a ‘bobotoast’. It’s scarily effective – as if Jeff Bezos, say, had taken over your favourite cafe, researched what you wanted, and delivered it with wit, panache and profitability. Next to all this, the actual food and drink feels almost incidental. Decent street terrace. Cafe Sperl (Gumpendorfer Straße 11, 6th District). Another favourite of mine, located in a backstreet close to, yet divorced from, tourist zones, the Sperl was recommended by a reader. I found it a treasure: spacious and atmospheric in a perfect 19thC way with faded plush seats, high ceilings, uniformed but efficient waiters, and a delightful, timeless air which it is hard to imagine persisting in any other European city. A brilliant space to spend time: I’ll be back (stop press: returned. Still lovely. Great clientele, too). 100% Viennese. Another place I’ve been impressed by good service. Oberlaa Konditorei (Kurbadstrasse, 10th District). 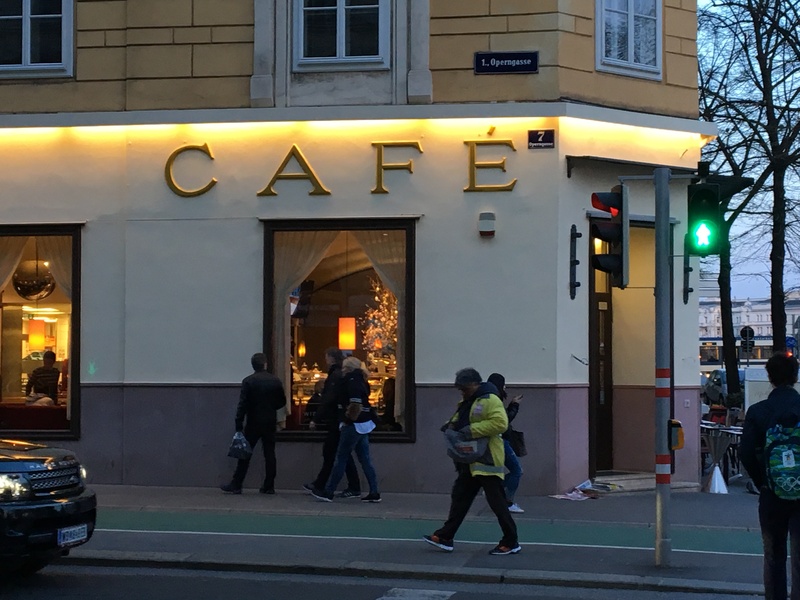 A Vienna institution which has spawned a chain of pleasant cafes, with a strong focus on cakes (I had the Apfel Streusel Kuchen – apple crumb cake – and a kleiner Schwarzer). 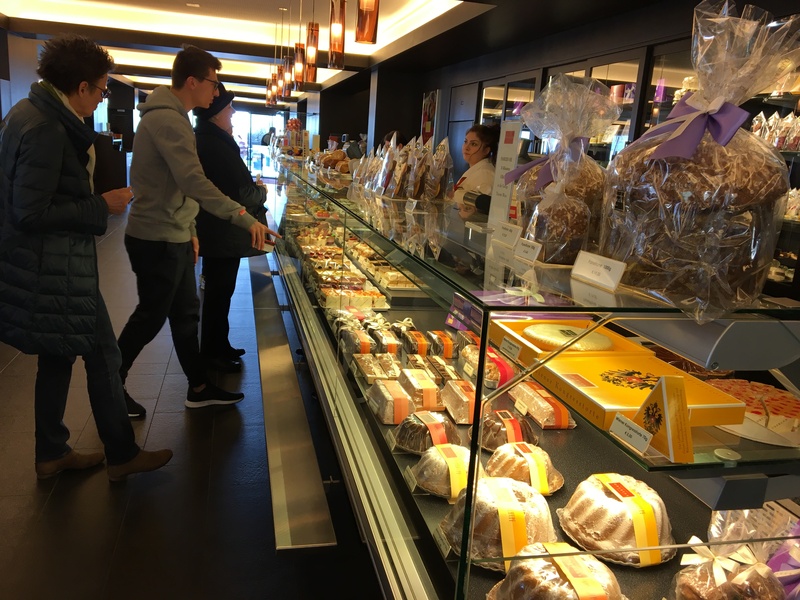 A bustling, lively place whose modern decor is offset, in the original near the Kurpark, by a certain grandeur and an impressively large range of cakes. Got a sweet tooth? You know you deserve it. Palmenhaus (Burggarten 1, 1st District). One of Vienna’s newer venues, opened in 1998, in an airy greenhouse built in 1901. In winter, you can sit inside; in summer, the terrace is beautiful, with a view of the Burggarten. Good for people-watching or chilling; no pressure to move. The furniture on the terrace is functional; that inside is comfier. A friendly place with a lively ambience. Cafe Schwarzenberg (Kärntner Ring 17, 1st District). 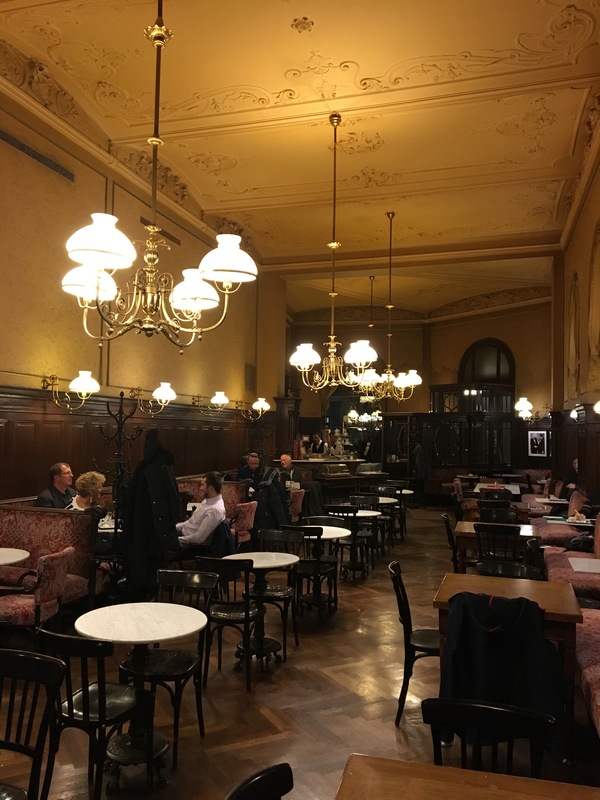 The Schwarzenberg calls itself the oldest cafe on Vienna’s mighty Ringstrasse and a sensitive late 1970s restoration has left it with one of the most pleasing interiors amongst the grand Viennese cafes. Service is in the stately Ringstrasse tradition where the customer is expected to know his or her place and waiters of immense experience know that when things get busy, thirsty clientele and uncleared tables will both have to wait a bit. Clientele is mostly international, but I warmed to the waiters seeing them joshing with elderly Viennese regulars. My Kleine Schwarzer (see pic) was delicious and hot. I liked the sugar dispensers instead of sachets. Ungar Grill (Burggasse 97, 7th District). It is perhaps cheeky to review the Ungar Grill, which is off the tourist beaten track and not strictly a cafe. Rather, it a place where eating and drinking (notably of beer) play as important a role as coffee consumption; and cakes are not a speciality. 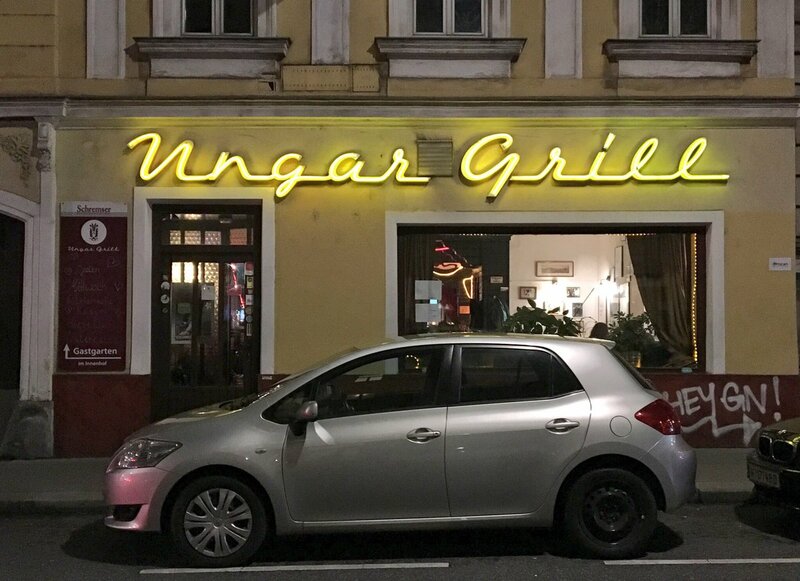 But the Ungar Grill deserves a mention as an exceptional example of the no-problem type of Viennese inner-city establishment where the prices are modest; the food decent; the service good; and both staff and guests have flair, perhaps based around the proprietors’ fondness for modern Austrian music and musicians, many of whom seem to hang out here. I like the neon; and it’s an excuse for a stroll down the Burggasse, an example of the vibrancy of some city centre zones outside the 1st District. Cafe Zartl (Rasumofskygasse 7, 3rd District). A friend recommended Cafe Zartl after enjoying a fine family breakfast, and I checked it out on a sunny Sunday evening to find I was the only guest. Despite this, the service was not outstanding. 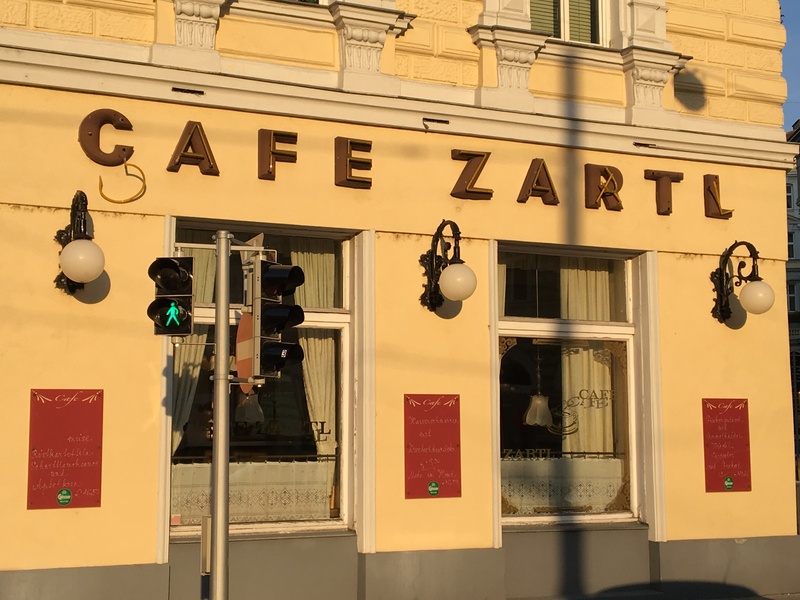 Outside and in, the Zartl looks perfect for a faded, traditional Vienna cafe, and is close to the Hundertwasserhaus, guaranteeing some tourist visits. But it doesn’t quite have the rich (tho’ equally faded) decor of, say, the Sperl, or masses of atmosphere (hard, admittedly, when you are the only guest). Worth a visit if you’re in the area. What do you think? I’d love to hear from you. Do you disagree – or have a favourite cafe I should check out? You can comment using the form at the foot of the page. And where was that cafe whose head waiter told my host – someone who had been going there for years – that if he was in a hurry he should have stayed at home? Guesses welcome! And if you want to read how I’d run a cafe, restaurant or Hotel, check out my Hotel Stories – entirely 100% fictional in every case. By Robert Pimm in Reviews, Robert Pimm on 31/03/2017 . Leigh. I’m surprised that an experienced hand such as yourself should have missed a golden opportunity to radically augment the number of visitors to your site by including pictures of the small and cuddly dogs that often accompany their large and less-than-cuddly owners to these cafés. A rookie error I agree! One of the dogs in the Cafe de l’Europe was particularly cute. …ich hab mit viel Vergnügen die ersten drei Kaffeehaus-Kritiken gelesen. 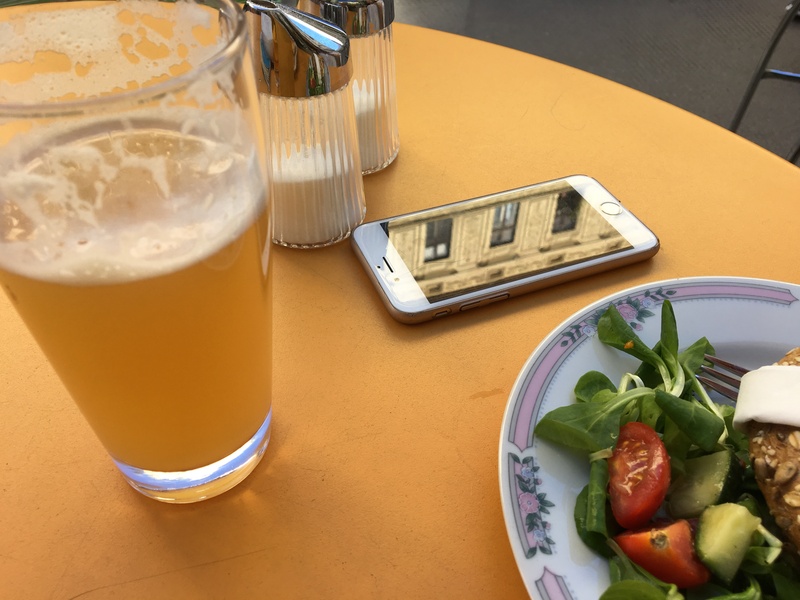 Wenn ich (als Salzburgerin) raten soll, in welchem Wiener Café ich beim – scil. vorhersehbar – vergeblichen Versuch den Zahl-Vorgang zu beschleunigen wohl Gefahr liefe, so angegrantelt zu werden, tippe ich auf den wunderbar schäbigen Bräunerhof in der Stallburggasse. Ein Besuch lohnt sich übrigens trotzdem. Die genau gegenteilige Erfahrung kann man/frau im (kleinen) Landtmann gegenüber der Albertina machen, ich glaube, es heißt Café Mozart: Dort merken sich die Ober sogar, dass Leute, die genüsslich frühstücken, fünf Minuten, bevor die Albertina aufsperrt, gezahlt haben wollen. Danke! Ich werde das Bräunerhof bald ausprobieren. Try Cafe Sperl for a real “Adams Family Treat” . Plush velvet sofas, harder than they look :); homemade cakes, all pretty good. Favourite the poppy seed with whipped cream; even a children’s play corner and I got a smile from the waiter… or was it wind! Thanks Julie – will check it out. Gumpendorfer Straße 11, right? Try Ansari in the Praterstrasse 15, 1020 for a lovely lunchtime or quick coffee experience. The little square itself could be taken straight out of a little French village with its wrought iron balconies and pale yellow exterior. would you mind reviewing café korb? siegmund freud liked it best and it has a famous jazzclub in the basement. related to that, the next logical step would be café stein in steingasse. it’s near the freud museum and it is famous amongst gay people. and how about the café malipop in ungargasse? ernst molden wrote a hommage to it in a song. PS: if you fancy a glass of wine instead of coffee some day, drop by at http://www.weinfreundin.blog and get some tips. glad you liked Cafe Sperl, I go there to switch off when I am feeling creative. Have you thought about reviewing the best places for brunch? Hansen – worth going there just to see the flower arrangements in the adjoining garden centre in the 1st district; Ansari and Das Campus, both in the 2nd district and Motto am Fluss, in the first district. Robert, that friend of mine wanted to reply to you about wild boars but the article has disappeared…. would you still be interested in his opinion? If so, where would he write? You should never say never:) or try something else. Want to be inspired:)?